1Department of Mechanical Engineering, Babol University of Technology, Babol, Iran. 2Neka Power Generation Management, Combined Cycle, Neka, Iran. Power plants are of great influential industries to the environment which could be studied in many ways. Since the optimum equipment would consume less fuel, the issue is mainly interested to those who are concerned about the environmental effects. Amongst various methods, utilizing twisted tapes inserts which are of passive type is interested in this effort. Although numerous types of tapes are widely utilized, modifying the tape configuration according to the flow specification is still interested. So here the center-cleared and perforated tapes are considered to be compared against the typical type. The 3D numerical simulation of finite volume method was applied to cover the flow field of the problem. The RNG k-ε turbulence model was responsible for the turbulent behavior of the flow and its circular trend. In order to develop the performance of the optimum tape performance, AL2O3 nanoparticles of different volume concentrations were added to the base fluid. The results showed that the Nu number was enhanced about 22% by using merely the center-cleared 14cm, while the friction factor was increased about 13%. To develop these amounts for the optimum configuration, adding nanoparticles of 0.1% concentration put and increment of 26% for heat transfer. Amongst many passive and active techniques evaluated for heat transfer rates increment inside circular tubes, various types of inserts have been chosen. In the so-called issue, turbulent flow is considered remarkably because of its industrial feature. This is a great challenge to obtain a high heat transfer rate with a low increase in flow resistance. In order to enhance the thermal performance of heat transfer devices such as swirling flow devices, coiled tubes, and etc various methods are applied . One of the commonly used passive methods for heat transfer augmentation is applying twisted tapes inserts and this is somehow associated with their simple configurations and easy installation . In these types, the heat transfer rate is enhanced by mixing the fluid at the central region and the fluid adjacent to the tube wall. In recent years many researchers focused on various designs of inserts in their effort . However, some researchers modified the conventional twisted tape geometries , for instance, Murugesan et al. applied V- cut twisted tapes to analyze the thermal-hydraulic behavior of a circular tube. Bas et al. investigated the flow in circular tube equipped with twisted tape placed separately from the tube wall. They admitted that this is a good solution for compact heat exchangers. Another issue which attracted researcher’s attention was using multiple short-length tapes instead. This yields to lower pressure drop in comparison with the full-length twisted tapes. Some researchers such as  verified the short length twisted tapes and their effect on heat transfer and pressure drop. They claimed that utilizing short length twisted tapes diminishes the pressure drop up to 50% in comparison with the full-length type. In recent years modified twisted tapes arouse remarkable interest amongst numerical and experimental efforts. Bhuiya et al. assessed V-cut twisted tapes and also perforated twisted tapes. They developed their studies for different designs. Modification of these tapes was reported in the various technical literature. Reports like broken twisted tapes investigation , serrated twisted tapes , delta winglet twisted tapes , conical cut-out turbulators . In other papers also it was seen that instead of decreasing the thickness of the thermal boundary layer it is possible to change the temperature profile. Zhang et al. represented that an increase of 171% and 182% was obtained using triple and quadruple twisted tapes, respectively. In their numerical study the friction factors were about 4.06-7.02 times, respectively that of the plain tube and this was shown by pressure drop calculation. Huang et al. concentrated on heat transfer enhancement using porous materials. They said that choosing porous materials as tube insert would increase the heat transfer rate up to 1.6-5.5 times larger than the simple tube. In other work Fan et al. investigated a circular tube equipped with louvered strip inserts and declared that according to numerical data the heat transfer and flow features change sensibly. Although many researchers tried to enhance the heat transfer by different modifications in tapes types, other used another additive technique using nanoparticles. Recently many studies have been performed to show the enhanced properties of nanofluids such as [16-17]. Safikhani et al. studied nanofluid flow in different coiled wire inserted tubes. The flow was laminar in their assumptions and nanofluid was considered as a promising approach for heat transfer enhancement. The thermal effect of nanofluids was greatly admitted in the various literature [19-22]. There are numerous investigations on heat transfer behavior in tube heat exchangers with different materials and nanoparticles, inserts and boundary conditions in both turbulent and laminar flow regimes [23-27] and the issue is still under more verification. Ghamartale et al. focused on the pressure drop caused by the addition of nanoparticles and said that this parameter insensibly affected. Some researchers [29-31] also verified the geometrical parameters of nanoparticles and assessed their impacts on heat transfer features. Despite many researchers performed numerous investigations on the so-called issue, there is no efficient study on highly turbulent flows in industrial tools. In this study, the flow with high Re number in order of 6×105 is numerically investigated and the effects of using different twisted tape inserts and nanofluids instead of the typical water were assessed. 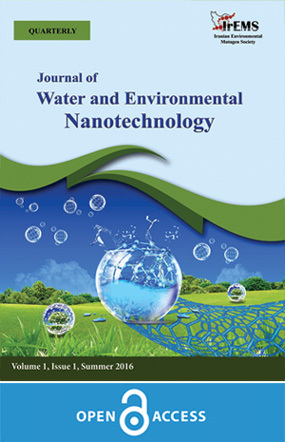 Al2O3 nanoparticles were employed for enhancing the heat transfer characteristics of based water. An improvement of heat transfer rate would be traced for optimum condition of the offered opinions. The geometries considered for this investigation embodies center-cleared and perforated twisted tapes for heat transfer enhancement. Since the twisted tapes chosen for the verification are considered to be used in industrial tube applications, the dimensions of the tapes correspond to the specified tube shown in Fig. 1. The diameter of the tube is 250mm and the length of the tube considered in this effort is about 4m. Fig. 2 represents the two type’s geometries of center-cleared and perforated tapes accompanying the typical twisted tape as a comparative base. As shown in above pictures two dimensions are considered for both centre-cleared and perforated types. The overall width of the tapes is 250mm and the length of the tapes go along with the tube length. In order to assess the role of center-cleared and perforated tapes more carefully, two different dimensions are designed. The perforated type experience 50mm and 100mm hole diameters and the center-cleared tapes expose to 70mm and 140mm cleared distances. Since twist ratio and other geometrical parameters were investigated in other researches before, here the concentration is not on them. In order to preprocess the geometry in a good manner, tetrahybrid grid was chosen for the geometries. Since the tapes offer curved geometry, the tetrahybrid grid assumed to cover the field efficiently. In order to evaluate the effectiveness of the grid density, grid independency test was performed considering the pressure drop as a representative parameter. Fig. 5 shows the results for four grid densities. The grid numbers of 681000, 942000, 1304000 and 1712500 were investigated for a definite geometry and it was seen that the results variation was diminished to acceptable amount after grid density of 1304000. So this mesh size was selected for further steps of the investigation. Where Gk presents the turbulence kinetic energy production. and are model constants and equal to 1.42 and 1.68, respectively. and are the inverse effective Prandtl numbers for k and ε, respectively. is the effective viscosity. Noteworthy to say that adding nanoparticles to the base fluid which is intended in this article would effectively change the fluid properties. These properties such as thermal conductivity, density, viscosity and specific heat of the nanofluid at different concentrations are estimated through the following equations driven by Sharma et al. . The computational fluid dynamics (CFD) approach was utilized to solve the flow model and FLUENT software which follows the finite volume approach was applied to solve the problem. For inlet surface, the velocity inlet condition which is a representative of Reynolds number is considered. The pressure outlet is also chosen for the outlet region. As the tube is assumed to experience the real condition of the industrial version, a constant temperature condition was applied to the tube wall. However, all solid surfaces have no-slip condition. As the flow was fully turbulent the RNG turbulence model was chosen. The solver is considered to be 3D, pressure based and coupled. Then the pressure and velocity coupling are handled by the SIMPLE algorithm. For momentum, the second order upwind scheme is preferred. The convergency criteria for all equations was considered to be of 10-5 order. As described earlier, 3D numerical simulation on twisted tape inserts was performed for both basic fluids called water and nanofluid containing AL2O3 nanoparticles. The results are presented in this section. Verifying the pressure contours of the five models in a specified Re number represented that the center-cleared tape with 14cm cleared region offered the most pressure drop in comparison to the other choices. The other tapes did not show significant differences in pressure contours. So, for more investigation, other parameters should also be assessed. In order to verify the swirl flow behavior caused by the tapes, the velocity vectors of the different cases are presented in Fig. 7. It is demonstrated that the swirl flow which encompasses tangential component of velocity was remarkable in the tube wall adjacent region in comparison with the central region of the tubes. Hense having weak axial flow in the central region may reduce the convection. In this figure, it is obvious that for the simple tube the flow is completely axial but other tubes experience circular flow. After that, the weakest tangential velocity at the center line was observed for the center-cleared 14cm tape. In order to assess the convection strength in different models, turbulent kinetic energy which is a representative of axial fluid movement was analyzed. In Fig. 8 it is displayed that the turbulent kinetic energy showed the maximum amount at the central region for the simple tube and center-cleared 14cm case. This is mainly due to low flow obstacle at the center line of these cases. In other cases because of poor axial flow, the turbulent characteristic of the flow was not remarkable. In order to see the heat transfer effect between the fluid and the tube walls, the temperature contours at the exit region of the tubes are presented in Fig. 9. Logically, the wall adjacent region has a lower temperature and the central region of all tubes show higher temperature. The overall temperature of this sections showed that the center-cleared 14cm tape had the lowest temperature amount for the flow at this section area. In order to observe the axial/circular behavior of the flow in two samples center-cleared and perforated tapes, the streamlines are driven in Fig. 10. It should be noted that the axial flow is sensibly available at the center line in center-cleared tapes in comparison with the perforated type. This would eventually claim that circulation of the fluid near the walls is available for both tapes but with different severity. After all, derivation of Nu number and friction factor diagrams would prepare more precise understanding. Fig. 11 represents the Nu number which is an indication of heat transfer for five tube conditions. As it is clear, the center-cleared 14cm offered the best thermal behavior through Nu number difference of about 22% more. For all cases, enhancing the Re number yielded to heat transfer augmentation. The two perforated cases couldn’t present better heat transfer rate in comparison with the typical type. On the other hand, observing the friction factor diagram in Fig. 12, it is obvious that reducing the blockage area in center-cleared 7cm, perforated 5cm and perforated 10cm diminished the pressure drop. But for center-cleared 14cm the pressure drop was more than the typical tape in this high Reynolds flow. As it is estimated, the center-cleared 14cm tape produced 13% more friction factor rather than the typical one. Throughout the results presented earlier, the center-cleared 14cm tape displayed development in the heat transfer rate. Hence, it was chosen for more investigation in various ambient temperatures. Fig. 13 shows the temperature difference between the inlet and outlet surfaces of the tubes in four different ambient temperatures applied on the tube wall temperature. As it is seen, by reduction of the ambient temperature the temperature differences grow for both center-cleared 14cm and simple tube. But it can be clearly admitted that utilizing center-cleared 14cm tape would increase the pressure difference rather than the simple tube and this is mainly due to providing more convective heat transfer rate in this case. As described before, adding nanoparticles for heat transfer enhancement is another approach amongst definite practical methods. Here AL2O3 nanoparticles were added to the optimum tape design in three different volume concentration and the results for heat transfer rate and friction factors are presented. Fig. 14 and Fig. 15 demonstrated the Nu number and friction factor for nanoparticles effect verification, respectively. Volume concentrations of 0.1%, 1%, and 5% were analyzed against the situation with no nanoparticles. The results for Nusselt number showed that the volume concentration of 0.1% presented the best thermal behavior. It can be comprehended that this lower concentration performed better because of its higher convective behavior in comparison with the other concentrations which are dense. The Nu number amount when nanofluid is used in the tube was definitely more than the situation with the base fluid. This is associated with thermal characteristics of nanoparticles and is estimated about 26% more. Investigation of pressure drops, or in other words friction factor, showed that there was little difference in friction factor for these flow characteristics and concentrations. 1-For this very high Reynolds number flow, modifying the twisted tape configuration would beneficially help to improve the thermo-hydraulic performance. In this effort, the center-cleared 14cm tape showed the most optimum performance and this means that definite geometrical configuration could be specified for the specific application. 2- Overviewing the results for heat transfer rate and pressure drop and the turbulent kinetic energy contours would help to say that in the center-cleared 14cm tape the flow near the walls is efficiently blended. The flow blockage at the center line is lower than other models, so the flow is accelerated in that region and as a result, the pressure drops. All these yielded to higher thermal behavior (about 22%) along with higher pressure drop (about 13%). 3- Utilizing nano-fluids instead of the base fluid which was water would offer better thermal performance. The concentration of 0.1% nanoparticles enhanced the Nu number up to 26% whilst the pressure drop did not change remarkably. This means that by using this additive approach, the optimum configuration of twisted tapes would also be functionally developed. 4- Appling center-cleared 14cm in different ambient temperatures which determine different operational situations in the site showed superior performance for all conditions. So it can be used permanently for all ambient conditions. 5- The simultaneous use of nano-particles and center-cleared twisted tapes would be a promising technique for improvement of such very high Reynolds number flow thermo-hydraulic performance and this would be a satisfying approach for less fuel consumption and less environmental effects. 1. Bergles AE. ExHFT for fourth generation heat transfer technology. Experimental Thermal and Fluid Science. 2002;26(2–4):335-44. 2. Guo J, Fan A, Zhang X, Liu W. A numerical study on heat transfer and friction factor characteristics of laminar flow in a circular tube fitted with center-cleared twisted tape. International Journal of Thermal Sciences. 2011;50(7):1263-70. 3. Vazifeshenas Y, Delavar M. Investigation of Thermo-hydraulic Performance of Circular Tube Fitted with Center-cleared Twisted Tape Using CFD Modeling. International Journal of Engineering, Trans A. 2015;28:476-82. 4. Eiamsa-ard S, Seemawute P, Wongcharee K. Influences of peripherally-cut twisted tape insert on heat transfer and thermal performance characteristics in laminar and turbulent tube flows. Experimental Thermal and Fluid Science. 2010;34(6):711-9. 5. Murugesan P, Mayilsamy K, Suresh S, Srinivasan PSS. Heat transfer and pressure drop characteristics in a circular tube fitted with and without V-cut twisted tape insert. International Communications in Heat and Mass Transfer. 2011;38(3):329-34. 6. Bas H, Ozceyhan V. Heat transfer enhancement in a tube with twisted tape inserts placed separately from the tube wall. Experimental Thermal and Fluid Science. 2012;41:51-8. 7. Ferroni P, Block RE, Todreas NE, Bergles AE. Experimental evaluation of pressure drop in round tubes provided with physically separated, multiple, short-length twisted tapes. Experimental Thermal and Fluid Science. 2011;35(7):1357-69. 8. Bhuiya MMK, Chowdhury MSU, Saha M, Islam MT. Heat transfer and friction factor characteristics in turbulent flow through a tube fitted with perforated twisted tape inserts. International Communications in Heat and Mass Transfer. 2013;46:49-57. 9. Chang SW, Yang TL, Liou JS. Heat transfer and pressure drop in tube with broken twisted tape insert. Experimental Thermal and Fluid Science. 2007;32(2):489-501. 10. Chang SW, Jan YJ, Liou JS. Turbulent heat transfer and pressure drop in tube fitted with serrated twisted tape. International Journal of Thermal Sciences. 2007;46(5):506-18. 11. Eiamsa-ard S, Wongcharee K, Eiamsa-ard P, Thianpong C. Heat transfer enhancement in a tube using delta-winglet twisted tape inserts. Applied Thermal Engineering. 2010;30(4):310-8. 12. Muthusamy C, Vivar M, Skryabin I, Srithar K. Effect of conical cut-out turbulators with internal fins in a circular tube on heat transfer and friction factor. International Communications in Heat and Mass Transfer. 2013;44:64-8. 13. Zhang X, Liu Z, Liu W. Numerical studies on heat transfer and flow characteristics for laminar flow in a tube with multiple regularly spaced twisted tapes. International Journal of Thermal Sciences. 2012;58:157-67. 14. Huang ZF, Nakayama A, Yang K, Yang C, Liu W. Enhancing heat transfer in the core flow by using porous medium insert in a tube. International Journal of Heat and Mass Transfer. 2010;53(5–6):1164-74. 15. Fan AW, Deng JJ, Nakayama A, Liu W. Parametric study on turbulent heat transfer and flow characteristics in a circular tube fitted with louvered strip inserts. International Journal of Heat and Mass Transfer. 2012;55(19–20):5205-13. 16. Sekhar YR, Sharma K, Naik M, Sundar LS. Experimental investigations on thermal conductivity of water and Al2O3 nanofluids at low concentrations. International Journal of Nanoparticles. 2012;5(4):300-15. 17. Syam Sundar L, Sharma K. Thermal conductivity enhancement of nanoparticles in distilled water. International Journal of Nanoparticles. 2008;1(1):66-77. 18. Safikhani H, Zare Mehrjardi A, Safari M. Effect of Inserting Coiled Wires in Tubes on the Fluid Flow and Heat Transfer Performance of Nanofluids. Transport Phenomena in Nano and Micro Scales. 2016;4(2):9-16. 19. Ghaffari O, Behzadmehr A. Investigation of the Effect of Nanoparticles Mean Diameter on Turbulent Mixed Convection of a Nanofluid in a Horizontal Curved tube Using a Two Phase Approach. Transport Phenomena in Nano and Micro Scales. 2013;1(1):64-74. 20. Sheikhzadeh GA, Teimouri H, Mahmoodi M. Numerical Study of Mixed Convection of Nanofluid in a Concentric Annulus with Rotating Inner Cylinder. Transport Phenomena in Nano and Micro Scales. 2013;1(1):26-36. 21. Azari A, Marhemati S. Model for Thermal Conductivity of Nanofluids Using a General Hybrid GMDH Neural Network Technique. International Journal of Nanoscience and Nanotechnology. 2015;11(2):71-82. 22. Kasaeian AB, Nasiri S. Convection Heat Transfer Modeling of Nano- fluid Tio2 Using Different Viscosity Theories. International Journal of Nanoscience and Nanotechnology. 2015;11(1):45-51. 23. Xuan Y, Roetzel W. Conceptions for heat transfer correlation of nanofluids. International Journal of Heat and Mass Transfer. 2000;43(19):3701-7. 24. Hwang KS, Jang SP, Choi SUS. Flow and convective heat transfer characteristics of water-based Al2O3 nanofluids in fully developed laminar flow regime. International Journal of Heat and Mass Transfer. 2009;52(1–2):193-9. 25. Abu-Khader MM. Further understanding of twisted tape effects as tube insert for heat transfer enhancement. Heat and Mass Transfer. 2006;43(2):123-34. 26. Sharma K, Sarm P, Azmi W, Mamat R, Kadirgama K. Correlations to predict friction and forced convection heat transfer coefficients of water based nanofluids for turbulent flow in a tube. International Journal of Microscale and Nanoscale Thermal and Fluid Transport Phenomena. 2012;3(4):283. 27. Hosseini SS, Shahrjerdi A, Vazifeshenas Y. A review of relations for physical properties of nanofluids. Australian Journal of Basic and Applied Sciences. 2011;5(10):417-35. 28. Ghamartale A, Saboori R, Sabbaghi S. The effect of micro/nano-particles on pressure drop in Oil pipeline: Simulation. International Journal of Nano Dimension. 2016;7(3):225-30. 29. Sabbaghi S, Mehravar S. Effect of Using Nano Encapsulated Phase Change Material on Thermal Performance of Micro Heat Sink. International Journal of Nanoscience and Nanotechnology. 2015;11(1):33-8. 30. Taheri A, Aboukazempour Amiri E, Ramiar A, Ranjbar AA, Rahimi-Esbo M. Numerical study of turbulent forced convection jet flow of nanofluid in a converging sinusoidal channel. International Journal of Nano Dimension. 2016;7(1):57-70. 31. Delfani S, Karami M, Akhavan Bahabadi MA. Experimental investigation on performance comparison of nanofluid-based direct absorption and flat plate solar collectors. International Journal of Nano Dimension. 2016;7(1):85-96.